I recently asked my fellow food-lover James if he would consider writing a few words about his visits to restaurants. We pretty much discovered our passion for top food together at Sat Bain’s in Nottingham and have continued traveling and eating around the country ever since. He’s more recently moved back to London and I hope to include more posts from the capital as time goes on. There are a multitude of hotel restaurants in London with great reputations, but few need to rely on that reputation as much as Angler does. Hidden on the 7th floor of the South Place Hotel in Moorgate on the outskirts of the City of London, you’re unlikely to stumble across it. However, it has a built a name which is synonymous with quality and sustainably sourced seafood, and as someone whose favourite course is normally the fish it has long been on my horizon. The first impression was disappointing, with rather soulless decor and bland dining room clearly designed to cater for the more extravagant end of city boy lunches. With a seventh floor restaurant you would expect a good view, but all we could see was the inside of some high end office space and a huge muddy hole where some Crossrail-related works were ongoing. 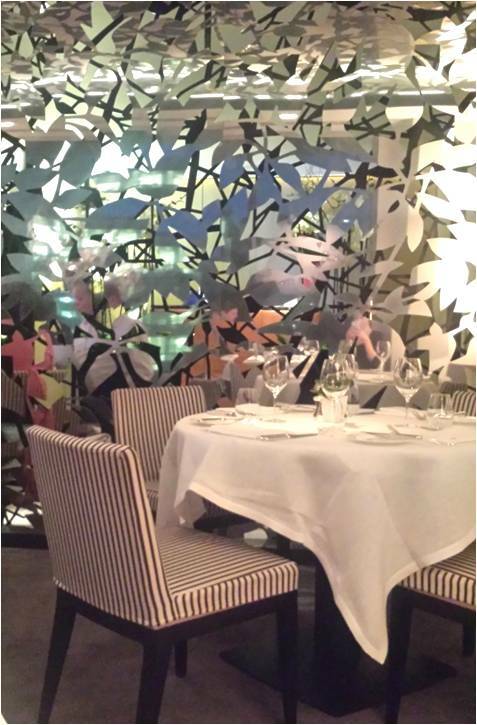 In a strange way I liked the view, but Galvin at Windows or any of the various Shard hosted restaurants it was not. Things were soon looking up with a delicious amuse-bouche of leek purée and samphire. The salty and crunchy samphire contrasted nicely with the smooth yet pleasingly thick purée. My companion also enjoyed an aperitif, “0”, a gin and champagne cocktail flavoured with violet, cherry and falernum (a Caribbean syrup more normally employed in rum cocktails). It was a delicate, well balanced drink that got progressively more intense as the sunken cherry mixed with every sip. We ordered off the a la carte menu; however, there was also a tasting menu and a very reasonable set menu on offer for those on more lavish or stretched budgets. Starters typically ranged between £10-15, main courses £20-25 with desserts coming in at £7. Given the restaurant’s specialty, we decided to exclusively order seafood, but there are vegetarian and meat options for those who are less enamoured with fish courses than I. The wine list was well stocked, with an obvious bias towards white wines. I ordered a New Zealand Riesling, a 2007 ‘Seresin’ from the Marlborough region, which was a particularly nice example of my go to pairing for white fish. The wine list was not excessively priced by London standards, but similarly not cheap by any means. I enjoyed a crab soup to start, served with a pleasing piece of theatre, as the soup was poured from a copper miniature saucepan into a shallow dish of white crab meat decorated with dollops of rouille (a thick sauce named after its rusty colour, formed of red chillies mixed with garlic and breadcrumbs) and deep fried oysters. The flavours were powerful, the oysters delicious and overall the course was a hit I’d gladly enjoy again. The rouille though was a little insipid compared to when I had enjoyed it at Arbutus (a fellow London 1*) previously, and the soup a little thin for my taste. 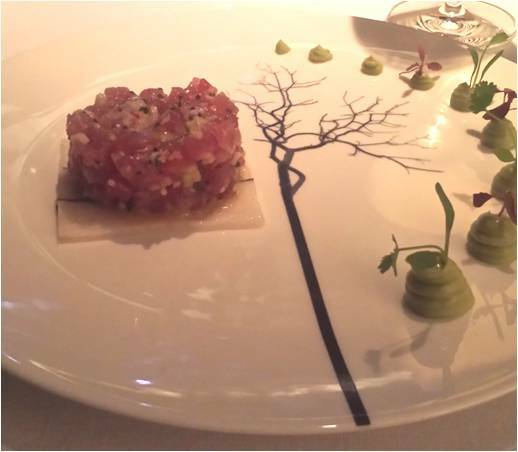 My partner went for a yellow fin tuna tartare flavoured with chilli and lime. It was beautifully presented, served with wasabi and avocado, and despite being technically less complex than the soup, was the more accomplished course. The standards remained high for the main course. I went for a turbot served with red wine soaked ragout of squid and fennel purée. As a disclosure, turbot is my absolute favourite fish, so my objectivity may reasonably be questioned. You didn’t need to try it to know the turbot would be delicious as it was the perfect shade of yellow, and married surprisingly well with the squid ragout, a combination which I had originally been dubious of. The other main we sampled was cod served with a bouillabaisse sauce, various ‘sea shore’ vegetables and orange flavoured fennel. 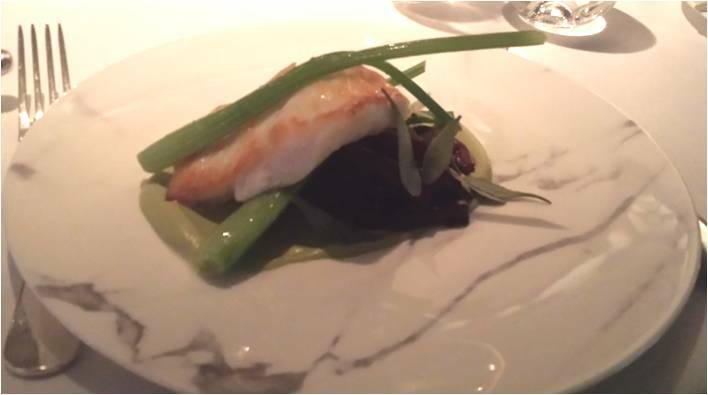 The cod was perfectly fried, which was particularly impressive given the thickness of the fillet, and the accompaniments were a fine complement to this well rounded course. I suspect few people come to Angler specifically for desserts and they will not be my residing memory of the meal. I had a somewhat hard to describe course, it was a light and puffy cream dessert, flavoured with coffee, covered with a smattering of amaretto biscuit crumb and dark chocolate, lastly a small portion of salted caramel hid underneath. It was pleasant, if unusual, but will not live too long in the memory. My partner went for elderflower panna cotta which was topped with a prosecco jelly and a very impressive blueberry granita. Definitely the better of the two desserts, though the presentation was somewhat out of keeping with the previous courses, it all being served in a glass on a paper coaster. Having been somewhat spoiled by visits to other similar establishments, I do have a couple of small bugbears from my visit. The first was the quality of the bread, which was a rather dull small round white loaf which we shared over the first two courses, and which was found wanting at this level of cooking. A bigger issue was the serving of the wine. I’m perfectly happy to pour my own wine and have it on the table; in fact that would be my preference. However, if a restaurant wants to have this pretension of storing it in inaccessible ice buckets off table then the waiting staff have to be more attentive, as I was twice left with an empty glass, and as a result finished my wine post-dessert rather than with the crab, tuna, turbot and cod I’d bought it to go with. 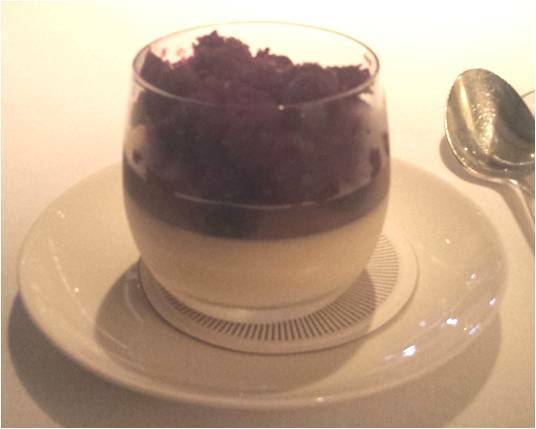 Overall this was a deeply enjoyable evening, and the Angler is well worth its Michelin star. If anyone is looking for excellent seafood, Angler would be the first restaurant I suggest.